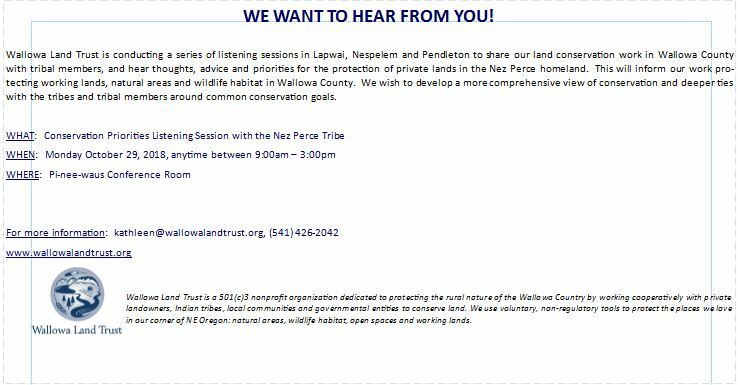 Wallowa Land Trust is conducting a series of listening sessions in Lapwai, Nespelem and Pendleton to share our land conservation work in Wallowa County with tribal members, and hear thoughts, advice and priorities for the protection of private lands in the Nez Perce homeland. This will inform our work protecting working lands, natural areas and wildlife habitat in Wallowa County. We wish to develop a more comprehensive view of conservation and deeper ties with the tribes and tribal members around common conservation goals. Wallowa Land Trust is a 501(c)3 nonprofit organization dedicated to protecting the rural nature of the Wallowa Country by working cooperatively with private landowners, Indian tribes, local communities and governmental entities to conserve land. We use voluntary, non-regulatory tools to protect the places we love in our corner of NE Oregon: natural areas, wildlife habitat, open spaces and working lands.